You don’t have to pay expensive postage for foreign e-books and can start reading straigthaway. The German satire novel “Look who’s back” – “Er ist wieder da” (translated into English by Jamie Bulloch) is an example: it is available as an e-book in different languages around the world. You may come across unfamiliar words while you are reading. Monolingual dictionaries are usually preinstalled – my Kindle has the Oxford Dictionary of English, the New Oxford American Dictionary as well as the German Duden Universalwörterbuch and some others. Dictionaries are particularly useful when you are reading books in foreign languages and you can buy additional bi-langual ones for e-readers. In the pre-ebook era I rarely looked up unfamiliar words, because it would have been too invonvenient and I usually understood the vague meaning from the context anyway. This didn’t really improve my language skills, but now I am learning a lot more each time I am reading a book in a foreign language. Some books mention unfamiliar concepts that can’t be found in dictionaries and are often not necessary to understand if you just want to grasp the basic meaning of something, but I have a lot of information at my fingertips through Wikipedia on my e-reader when I am connected to Wifi. This would be another wasted learning opportunity with print books because it is the same as with dictionaries: I find it too tedious to use an external encyclopedia. Changes can be implemented quickly into e-books, especially if they are written by self-published authors, who are able to do everything themselves. New books can be launched faster as well. I am sure this will be even more important in future, since the information we rely on is changing more and more rapidly. Self-published e-books are usually cheaper than those from publishing houses, as self-publishers have lower expenses and are still able to earn good royalties. In addition, self-publishers have more flexibility in various ways and are for example free to decide the length of their books. I read several good quality self-published non-fiction e-books that focussed on the essence of a topic and saved me some time. Translators can be publishers as well, sometimes finding interesting books that nobody else would publish. Certain websites are featuring special e-book offers for limited time periods, for example bookbub. A lot of classics are permanently free for Kindle, among them one of my favourites, The Adventures of Huckleberry Finn. I love marking text – whenever I want to read the most interesting parts of a book again, I just flick through the marked text. In e-books I can add markings and notes quickly and may change or delete them just as easily. In print books, I can sometimes find certain parts of the text only after an extensive earch, if at all, even if there is an index. The search function in e-books makes things a lot easier. When I moved to the UK many years ago, I arrived with just one backpack and one suitcase, I left a lot of books behind and most of the weight that I carried consisted of print books as e-books did not yet exist back then. That was quite a pain and I am glad I will definitely take all my e-books with me when I am moving again. Paper books can also take up a lot of space in moving vans. And just think of the modern nomads who are living without a permanent residence nowadays – unthinkable without an e-reader! Some might think I am exaggerating now, especially those who don’t read much or who are lucky enough to live in a large home, but I am not joking: accomodation costs are an issue for me as well. London is one of the most expensive cities of the world, but I believe that those who are based in smaller towns can also reach their limits with print books if they cannot or do not want to spend more than necessary. When I am out and about reading at a cafe, a pub, in a park or wherever I go – I always have my whole e-library on me. On holiday, I can buy as many e-books as I want in advance and download more at my holiday destination, provided I have WiFi access. I don’t have to carry print books and on the plane I save extra charges for heavy suitcases. It is easy to hold an e-reader comfortably with one hand, whenever this comes in useful. The background lighting of e-readers is an advantage when you don’t have sufficient light. In case you are sharing your bed with someone and one person is sensitive to light and wants to sleep and the other one prefers to read late at night, this unobtrusive lighting may be very useful. But make sure you buy an e-reader that actually has background light or buy an e-reader cover with integrated lighting. Some people say they wouldn’t want to do withouth those wonderful looking print book covers on their bookshelves. I have had a look at all my covers again and must admit that I do really like some of them, some are kind of okay but there are others that I find dull or ugly. With an e-book cover of my choice, however, I will always have one that fits my taste. And then there are people who say they love to hold a print book in their hands and wouldn’t want to use an e-reader for that reason. Again, I prefer an e-reader cover of my choice. They come in many different kinds of of textures, even fluffy onves, if you fancy them. Oh, and the smell… Don’t you think that print books emit a wonderful odour? I personyally disagree, as I read a number of books that smelled horribly, probably due to cheap paper, not to mention really awful smelling books from public libraries and I prefer the neutral, non-smelling e-experience. And last but not least you can change the font size of e-books. When I showed my e-reader to my parents, this was the feature they liked best. It is very handy for people who have problems with their eyesight and might otherwise have difficulties reading any books at all. So, that was me and my reasons. Did I miss anything that you find important? If so, I would love to hear from you. As usual, there was a lot on offer at the Frankfurt Book Fair, the biggest book fair in the world: gazillions of publishing houses and other companies with stalls plus anything else related to books including an increasing number of self-publishing events and suppliers. 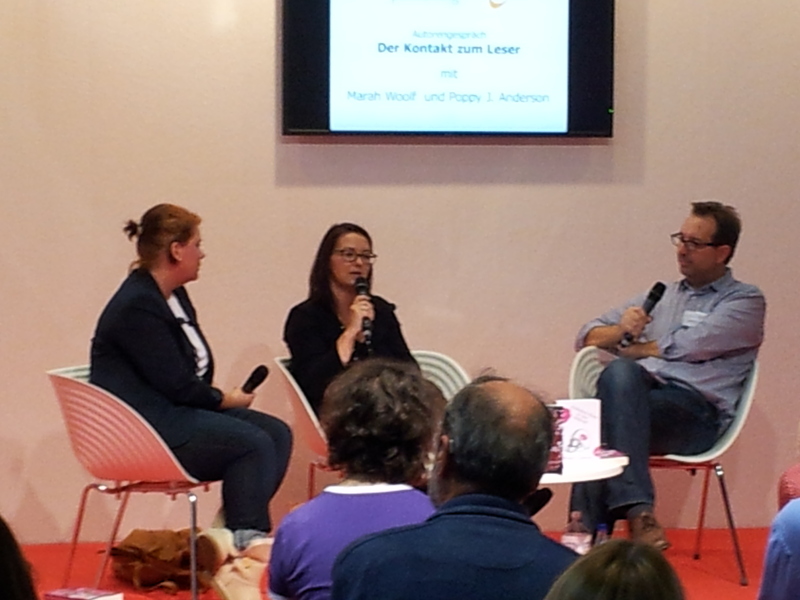 I attended several events for self-publishers in the German language area. The picture shows two successful German authors, Poppy J. Anderson on the left and Marah Woolf in the middle. They discussed how to connect to readers and both speakers are very much in touch with their audience. Apart from strategies like social media, Poppy mentioned one of her quirky ideas: she once hired a handsome male model who dressed up as an American Football player since her books are dealing with this topic. Her apporach seems to work since several of her books are ranking high in the Kindle charts. – Format will not be important anymore, content is king, and there will be more and more interaction with content. – Many joint projects with more than one creator will come into being. Interesting stuff for thought, and both points are positive for self-publishers including those who are into international self-publishing because cooperating with people in different parts of the world is so easy these days. Then I attended an event with self-publishing service providers Tom van Endert of Ruckzuckbuch and Sönke Schulz of Tredition. Both websites are only in German, though. Sönke Schulz mentioned if you really want to have a chance to get into German bookshops, it is not just important that your provider makes sure it is in the “Verzeichnis lieferbarer Bücher” (list of German books in print), but you need to get your books to wholesalers, too. Both Tredition and Ruckzuckbuch provide this. Theoretically, German bookshops can also order from “Verzeichnis lieferbarer Bücher”, but it involves more hassle for them and they prefer not to. Tredition and Ruckzuckbuch are cooperating with each other, and whereas Tredition have more experience dealing with digital, the people of Ruckzuckbuch have a print tradition using eco-friendly resources and they offer a personal customer service plus a free paperback book with lots of information on self-publishing in general and their service in particular (only available in German). I had a lot of disscussions with translators in Frankfurt as well, and some of those that I met had already worked with indie authors. There are three models: The majority are being paid a fee, a tiny minority are doing a royalty-split with the author, and then there is the hybrid model, that is receiving a fee, but doing a bit of marketing as well. For authors who want to have their book translated on a split-royalty basis, the platform Babelcube currently still seems to be the most promising way forward. Even after the Fair, I am now still discussing with translators and authors the best possible ways of cooperating with each other. It didn’t come as a surprise that translators who are native speakers of English are the ones who have been approached by indies more often than anyone else – having a book in English is popular (See also my previous article). I learned about an extreme example in Frankfurt: one author had not been able to pay for a translation into English, but was so desperate to achieve this that he offered the translator to share not just the royalties of the translation, but the royalties of the original book as well! If you would like to read more about the Fair from the perspective of self-published authors, I recommend the excellent article Frankfurt For Indies – An Abundance Of Abundance by Nerys Hudson of the Alliance of Independent Authors. And here is a picture that is representative of the last couple of days at the Fair. 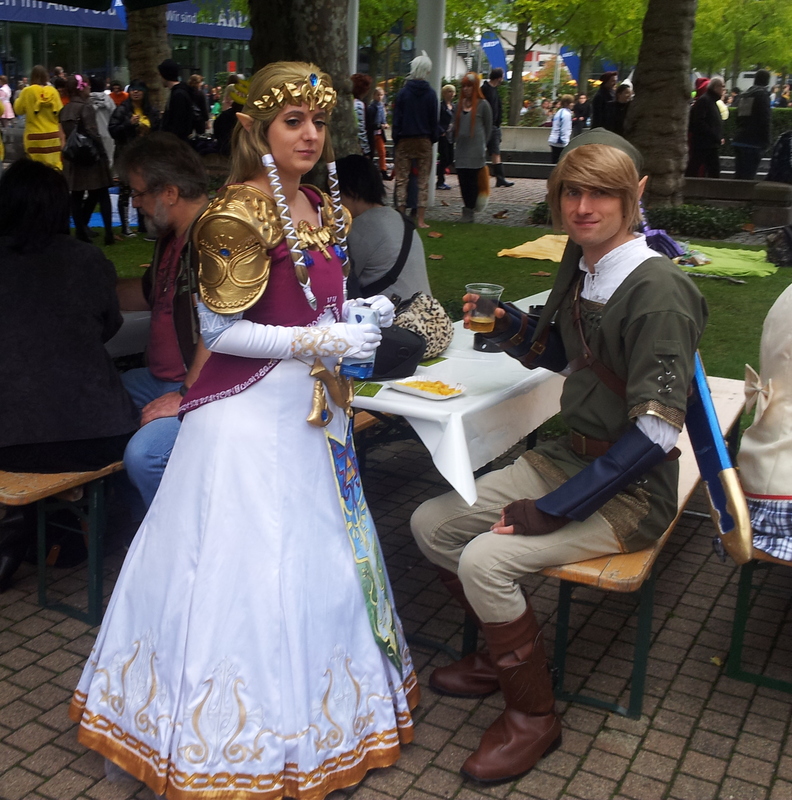 It hosted the German National Cosplay Championship that made everything more colourful and fun – you could see many young people in fancy costumes, which is the whole idea of “costume play”: to dress up like characters from books, films etc. (Look at their ears ;-). Many books are translated from English into other languages, but not vice versa. A certain rumour is wrong, though: There is no “stigma” attached to translations in the English-speaking world… they can be just as popular as original English books. The last London Book Fair was an eye opener for me: A bookseller told us, that is a group of literary translators, readers did not care at all whether they were reading a translation or not, they read all books like originals. Nonetheless not many foreign books make it into English and I am going to tell you why I believe, self-publishing could be a game-changer. 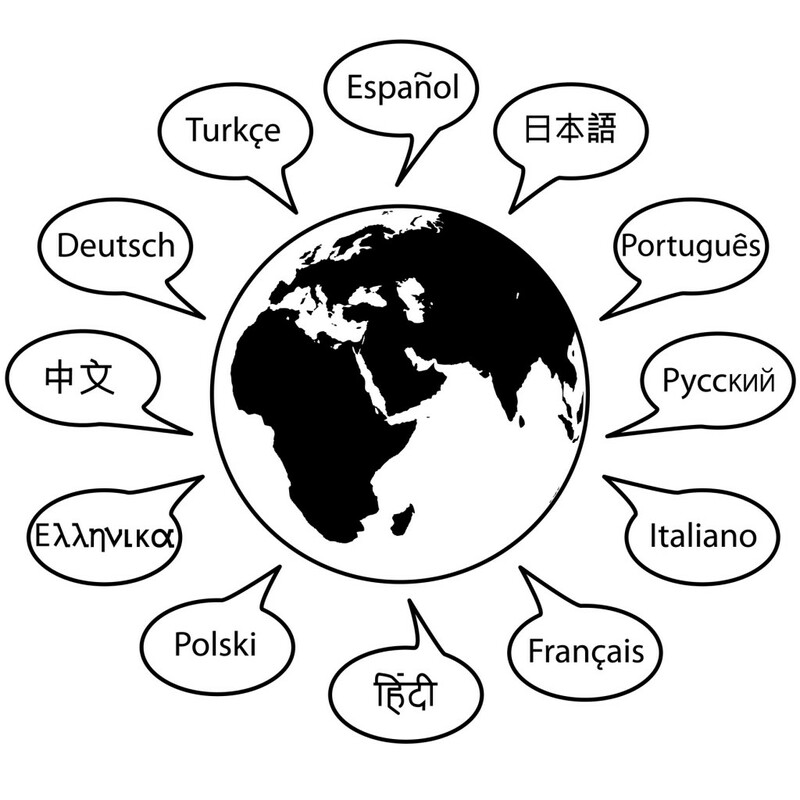 Learning foreign languages is not high on the agenda in most English speaking countries as English is the lingua franca of the world and therefore it doesn’t come as a surprise that the staff in publishing houses are often not able to read foreign books to find out whether they would be worth translating. This is even more relevant for books from so-called “smaller languages”. Let‘s say you have written a great book in Bulgarian: It is still less likely to be accepted by an English publisher than a book in a “bigger” language like Spanish or German. But authors can successfully self-publish in translation, regardless of their native language. I hear this reason all the time: Too many books are published in English and there simply isn‘t enough space left for books in translation. This is only true for physical bookshops, though. Self-published books are usually sold via online shops with lots of space, even for translations. Authors are nowadays expected to do a lot of their own marketing, even if they are with a publishing house. Most of them have their own website, blog or social media, sometimes all of it – but in their own language. I suspect this could be another reason why most English language publishers prefer to just stick with the large number of English language authors instead of foreign authors who require them to do more work. In case an author does have an English translation contract with a publishing house, their publishers are usually the ones who choose the translator. But what if the author doesn‘t like the translator‘s voice? In most cases he or she will only find out when it is too late. A director of a London publishing house told me they stopped doing translations, because their foreign authors often spoke English reasonably well and were not always happy with the results. Self-published authors, on the other hand, can look for their own translators who they feel comfortable with. When looking for someone, it is a good idea to find out which genres translators specialize in and read parts of their past translations to get a feel for their voice. Not only could this lead to a far more satisfying experience, you may also build a long-term working relationship which would make subsequent book translations easier. A book should ideally be translated by someone into their native language, but provided your English is very good or your native language is a rare one, you might even consider translating the book yourself and working with a good editor. I recommend editors in any case, even if there is a translator involved. In addition, I would always do sample translations and specify from the start how you want to work with each other – especially who has the final say – to avoid misunderstandings. Roles are a lot more flexible in self-publishing than in the traditional publishing world. Not only can authors be publishers now – translators could be publishers, too. And don’t underestimate your potential power if you are a translator and your native language is English – most foreign authors would love to be translated into English. Not only does this global language promise a large audience, but once the book is in English, it can also be more easily translated into other languages. As a translator, you could look out for books that you like and get in touch with the author. If a translator really likes the book, the work is more fun and the translation is usually much better as well. As someone who translates into English, you might also like to look out for books of foreign publishing houses – even the vast majority of them are not picked up by an English language publisher, so why not offer your services via self-publishing if it is done in a professional way including editing, proofreading and marketing? I wouldn’t be surprised if you had some success with this. I believe there are much more opportunities these days if everyone is prepared to think outside the box! I have had interesting discussions with other translators following my last article and Joanna Penn’s interview with me on her blog, therefore I am now writing a bit more about creative translations. Film subtitling – better paying alternative for creative translators? When I first moved to London, I wasn’t earning enough money with literary translations to make a living in this expensive city and I was looking for alternatives. After a while I discovered subtitling, because many films were put on DVD and there was a demand for subtitlers at that time. After a while, though, the subtitling agencies had found enough translators and the demand decreased also because all the old films were already on DVD. Now the companies gradually started lowering their rates until they were so low that I quit again and took on different work. However, something interesting happened recently: I was contacted again and was offered a higher rate, due to the fact that Netflix needs a lot of film subtitlers who translate into German and probably into other languages as well these days. If you are looking for work like this and especially if you have experience, you could for example contact IMS. Even though there is a demand for subtitlers right now, I suspect this is going to change sooner or later, as subtitling is rather popular. You are watching films all day and you even get paid for it, right? It’s not that easy, though, and it does need some skills. Nonetheless, I do understand why it is popular. If you are someone who is just starting out and wants to learn something related to translation, I would rather go for a more general type of course like the MA in translation, interpreting and subtitling at the University of Esssex instead of a course in subtitling alone. I have no doubt that the industry will change again and the more skills you have, the better. People can often earn more money if they are not afraid of tough negotiating. This does not come easily to most women who were taught to be nice girls and don’t demand too much. I admit that I have problems with fighting for my rights all the time as well and therefore I prefer a different long-term solution. As mentioned above, you can read more about my own choice and the translation process in self-publishing on Joanna Penn’s blog. Pieke Biermann, German literary translator and author, said this in an interview many years ago and there is a lot of truth in the statement. In a way, being invisible is actually required. The translation should be a good read in the same way as the original and you are not supposed to guess straight away that you are not dealing with an original work. The vast majority of readers do not even care whether they are reading a translation, let alone who translated the book and I am not just talking about average readers. A friend of mine teaches creative writing and literature and when we happened to talk about a book she had worked with in one of her classes, it turned out I was the translator – she had not noticed. Even though translations are vital for the success or failure of a book in another language, they are not just usually invisible, but also generally poorly paid. The housework metaphor fits here as well – housework is important, but what about the money? 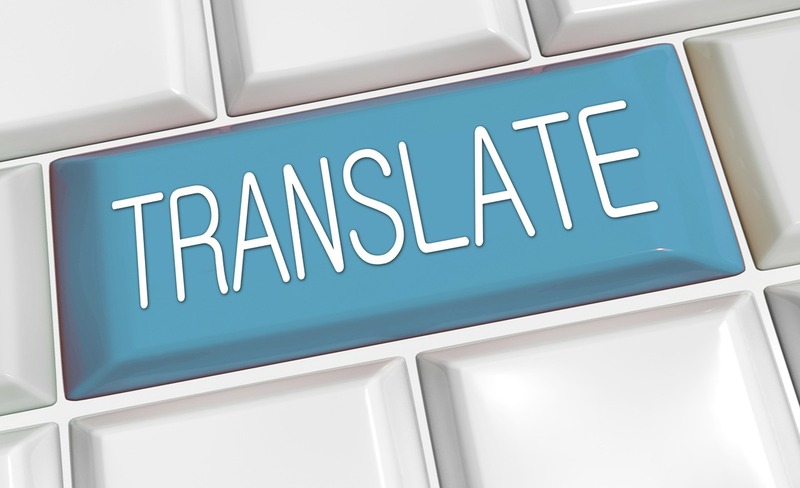 Poor payment does not exactly encourage a great outcome if the translator needs to make a living and thus has to finish the translation as fast as possible. This is especially true for translations into languages other than English. Into English pays better, since there are simply not as many translators who can do the job – translators are usually translating into their own language. 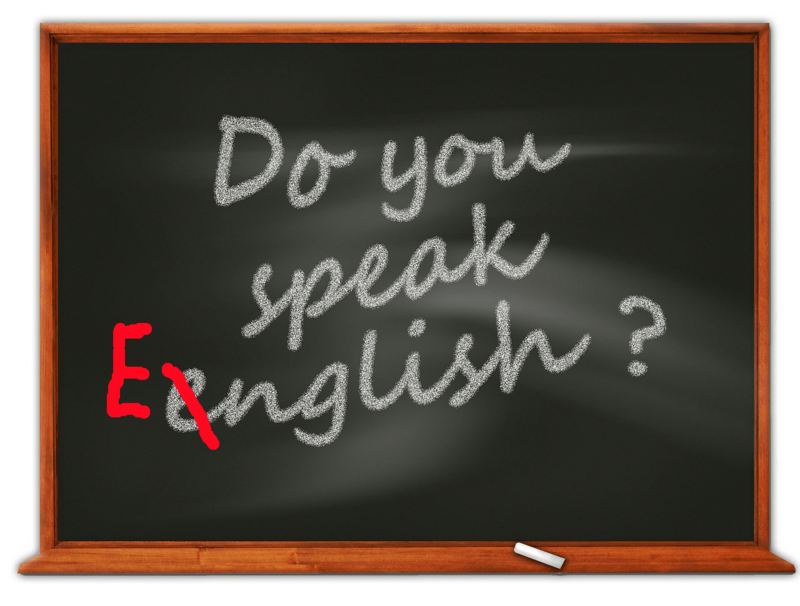 English native speakers are often not encouraged to learn foreign languages, therefore these translators do not have as much competition as their colleagues from other countries. But despite the low income, most literary translators are still doing a great job as they are usually really passionate about their work. I believe that self-publishing can be an interesting alternative for them that might provide more long-term income, if they are prepared to participate in book marketing and play a much more visible role than they are used to. I am cooperating with author J.F. Penn and we have recently self-published her first thriller Pentecost in German on a split-royalty basis, which means we are sharing the income. This is a risk, but at the same time there is more potential than going the traditional route with publishing houses if it goes well. Another way would be to be paid a fixed fee. I suspect most translators would currently still want to choose this route, because their low income does not allow much risk-taking. They should bear in mind, though, that they have the freedom to choose a self-published book which they really like and find worthwhile for translation. If authors and translators are working on a split-royalty basis it is in the translators‘ own interest to contribute as much as possible to the book marketing. I must admit that this does not come easily to me – I am just not used to being visible. Therefore I am glad to work with an experienced self-published author like Joanna who has such a great positive attitude and I intend to share more of my experience on this blog. You can read my interview with Joanna Penn on her blog. If you have never considered attending Frankfurt Book Fair as a self-publisher, you might want to think again. It is always advisable to book a hotel room as early as possible, because there is usually a shortage in the end due to the masses of fair visitors. In case you are used to the size of, let‘s say the London Book Fair, you might be in for a surprise. The area in Frankfurt is so huge that they use shuttle buses to take you from one hall to another. I would advise women who love wearing high heels to think twice whether you really want to torture yourself – I saw ladies suffering badly in the past because they underestimated the long ways. Due to the dimensions in Frankfurt, I would not advise to just go there to stroll and look whatever you can find. To make the most of it, I would plan ahead. Therefore I think the programme for self-publishers and authors is an interesting one and I intend to visit the fair myself.